The value of pipe #344 is n/a points. I saw Tom Clasen at the Conclave of Richmond Pipe Smokers pipe show in October, 2001. He had this pretty nice pipe he wanted to part with. The pipe has a faint scratch on the bowl and seems to have been well smoked before, but it looks like it should still smoke OK. 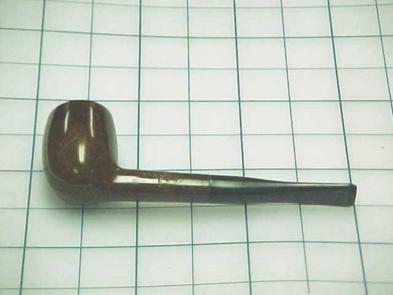 I already have a good exemplar and another to smoke so, uncommon as it is, this one must go the Pipes for Sale page. Josep Targa, from Spain, found it almost immediately and snapped it up.